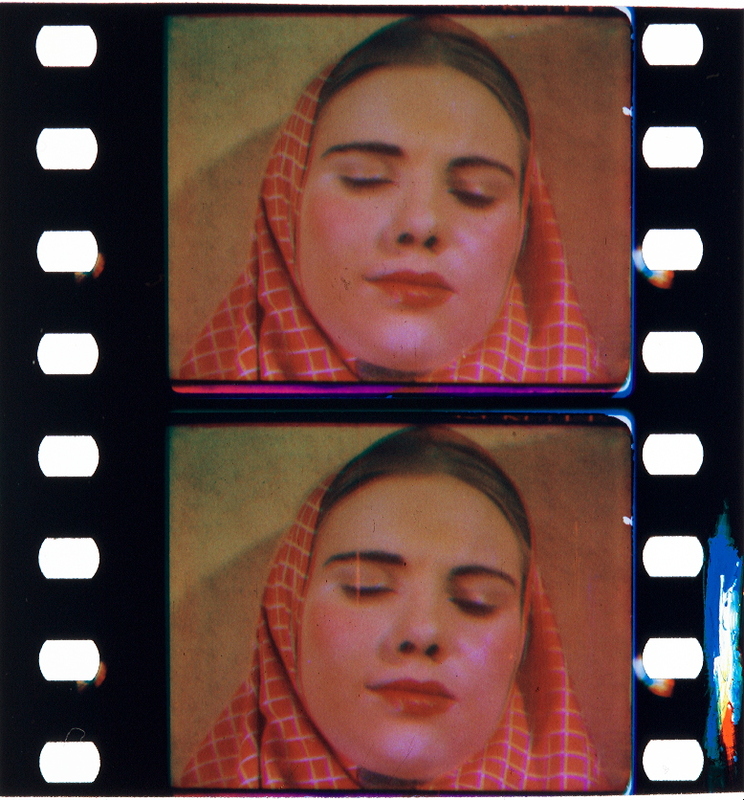 Pagliacci (GB 1936, Karl Grune) is one of the few feature films shot on Ufacolor or its foreign brands. Credit: Courtesy of BFI National Archive. Photograph by Barbara Flueckiger. Film: Pagliacci (GB 1936, Karl Grune). Chemicolor Samples (Kodak Film Samples Collection). 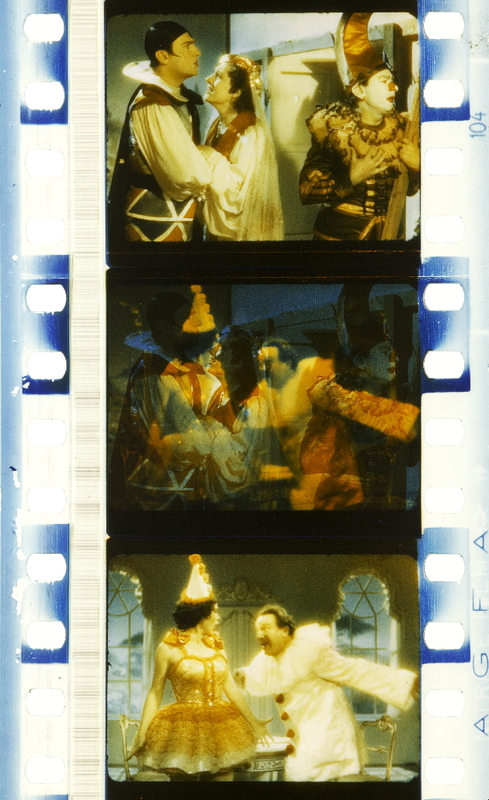 Photographs of the Chemicolor Positive by Josephine Diecke, SNSF project Film Colors. Technologies, Cultures, Institutions and Joëlle Kost, ERC Advanced Grant FilmColors. Chemicolor Samples (Kodak Film Samples Collection). Credit: National Science and Media Museum Bradford (Kodak Film Samples Collection). 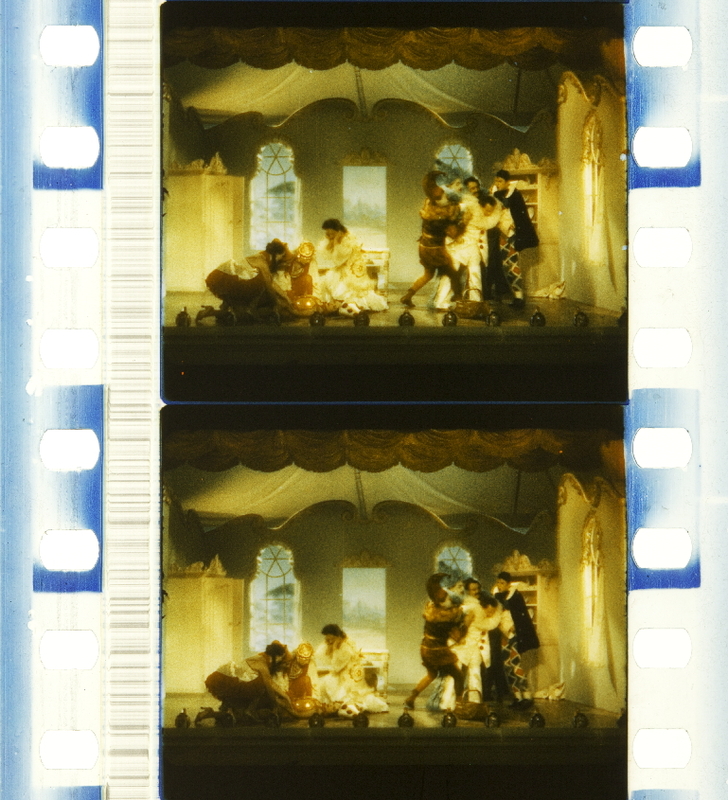 Photographs of the Chemicolor Positive by Josephine Diecke, SNSF project Film Colors. Technologies, Cultures, Institutions and Joëlle Kost, ERC Advanced Grant FilmColors. Chemicoior was the name under which the German Ufacolor Process was marketed in Britain. Ufacolor was also marketed under the name Spectracolor. The process used Agfa bipack negatives loaded with the emulsion sides facing and separated by a colour filter. 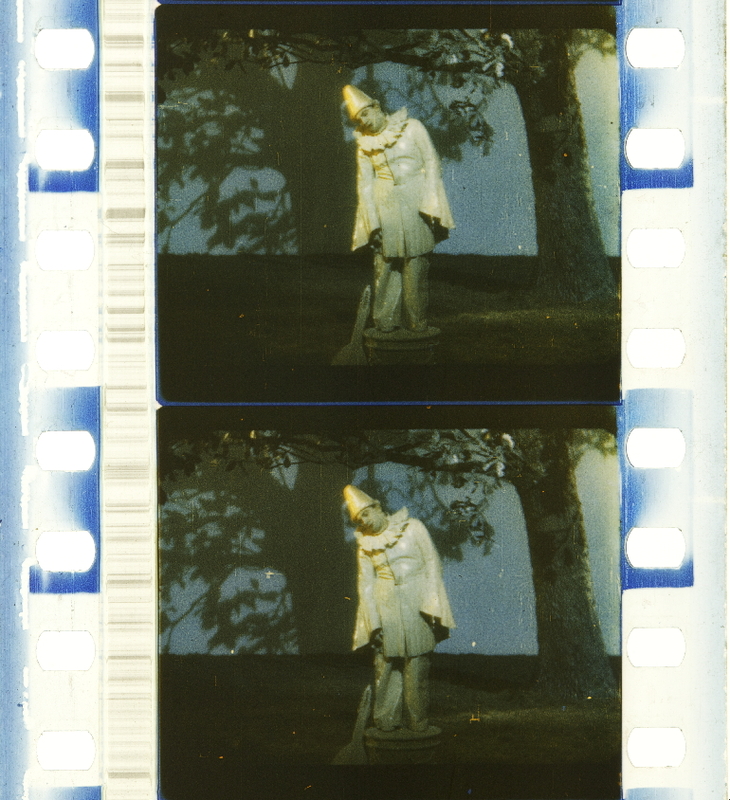 The negatives were printed onto double-coated film and toned with complementary colours. The process was formally demonstrated on 27 August 1936 at Elstree Studios. About 1,200 feet of film was screened, mostly outdoor subjects of European tours and indoor costume shots. 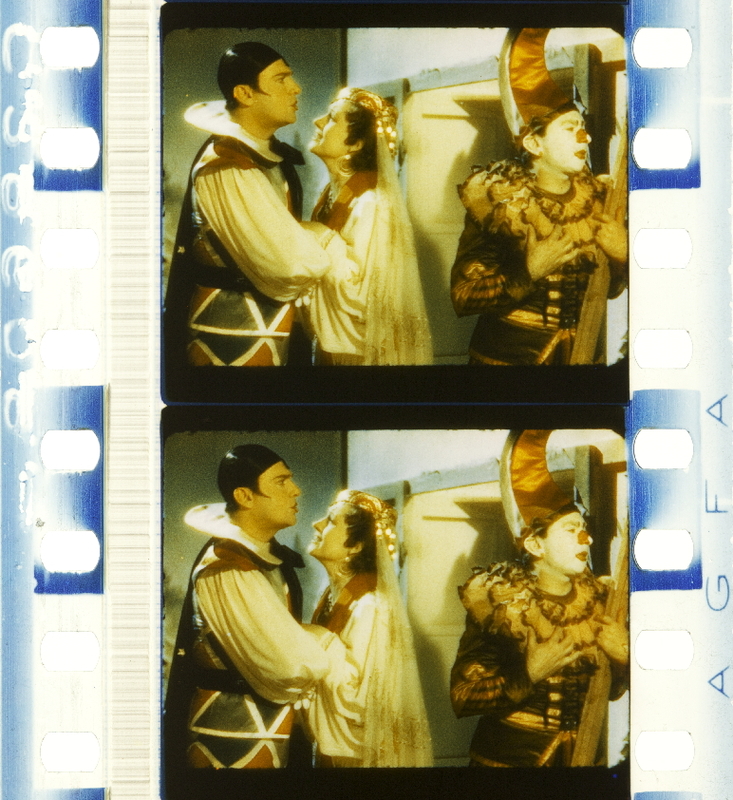 At the time of the demonstration, Austrian director Karl Grune, who had left Germany in 1931 and settled in Britain, was using Chemicolor in a film of the opera Pagliacci for Capitol Films, under managing director Max Schach. Grune was the managing director of British Chemicolor, which was, along with Capitol Films, part of the Schach Group. Evidently Grune and Schach had been testing the process because in April or May of 1936 Grune went to America with colour film of Pagliacci and persuaded William Fox to come out of retirement as an executive director of British Chemicolor to help with the development and commercial exploitation of the process. Chemicolor was sold in part on its simplicity. 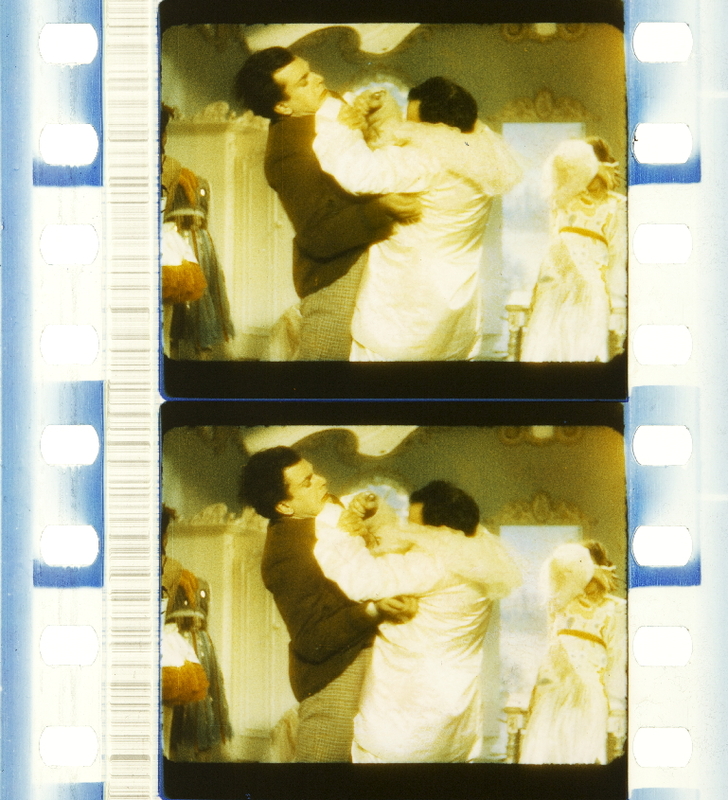 The process only required 10-12 per cent more light than black-and-white film for shooting and, before the first demonstration, in July, 6,000 feet of Chemicolor film was shown in cinemas around the country to show that no additional light was required in projection. It was announced that colour prints could be ready for the screen in two days and that producing large numbers of release prints was unproblematic. Further reports stated that make-up tests showed that women needed less make-up than for black-and-white film, and men no make up at all. Any camera could be used ‘adapted only by a special device’, while any cameraman could achieve perfect results after a little experimenting with the process. Pagliacci, starring celebrated singer Richard Tauber, was released in 1936 with Chemicolor sections. Though the film was well received little more was heard about Chemicolor and British Chemicolor was in receivership by 1939, possibly due to the increasing concern over Germany and German companies operating in the UK in the run up to World War II. Cornwell-Clyne, Adrian, Colour Cinematography (London-Chapman & Hall, 3rd edn, 1951), p. 331. Kinematograph Weekly, 30 July 1936, p. 1. Toda’s Cinema, 24 August 1936, p. 4. Today’s Cinema, 28 August 1936, p. 2. Today’s Cinema, 7 October 1936, p. xiv. Today’s Cinema, 20 May 1937, p. 1. Limbacher, James L., Four Aspects of the Film; A History of the Development of Color, Sound, 3-D and Wide-screen Films and their Contribution to the Art of the Motion Picture (New York: Brussel and Brussel, 1968), p. 40. “Ähnlich wie im Ausland, waren auch in Deutschland viele Versuche mit verschiedenen Verfahren unternommen worden. Während jedoch in den USA dem Dreifarben-Technicolor-Prozeß seit 1934 der Durchbruch geglückt war und 1936 auch in England Einführung gefunden hatte,1 wurden in Deutschland fast nur Werbefilme farbig hergestellt, bei denen das Zweifarben-Ufacolor-Verfahren an erster Stelle stand. Mit Ufacolor, dessen Materialien die Agfa lieferte, wurden von 1931 bis 1939 einige Millionen Filmmeter gedreht. Für die Aufnahme diente eine Bipack-Kamera, also eine Kamera mit zwei Schwarz-Weiß-Filmen für die beiden Farbauszüge; kopiert wurde auf dem doppelseitig beschichteten Agfa-Dipo-Film, der in den Farben Rotbraun und Berliner Blau chemisch getont wurde.2 Nur mit diesen beiden Farben ließ sich schon ein überraschender Farbtonreichtum erzielen, so daß Filme für die verschiedensten Werbezwecke hergestellt werden konnten. Ähnliche Zweifarben-Prozesse gab es auch in den USA – dort sogar noch bis 19543 – und in England, wo das Ufacolor-Verfahren zunächst unter dem Namen Chemicolor und ab 1935 als Spectracolor benutzt wurde. 1 Kalmus, H. T.: Technicolor adventures in cinemaland. J. SMPTE Bd. 31 (1938) Nr. 6, S. 564 ff. “Pagliacci (1936) was a black-and-white British film but featuring a process known as British Chemicolor for the prologue and final sequence, both of which depict a comic opera troupe’s stage performances while touring in Italy. 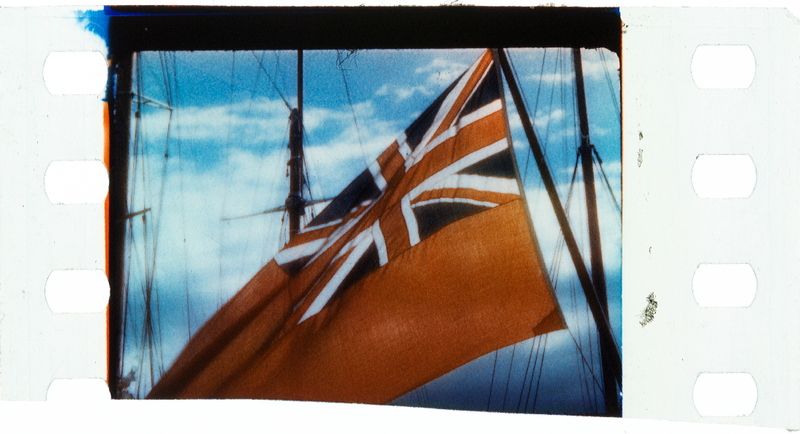 Based on the German Ufacolor process, British Chemicolor did not require a special camera and used bipack negative film. 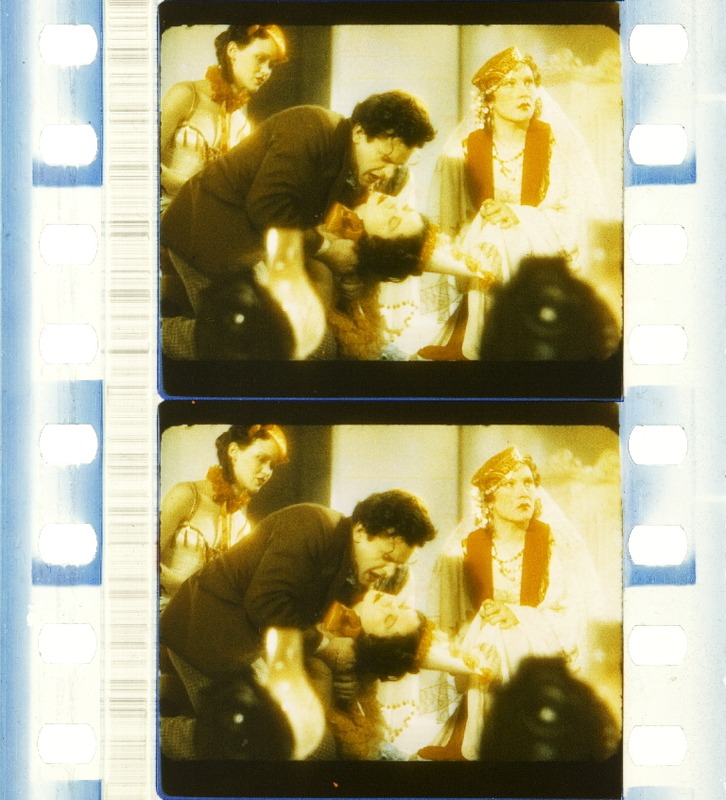 Printing involved chemical toning of double-coated film.20 The film’s theme of backstage drama encouraged the interspersion of stage scenes shot from the viewpoint of the audience within the diegesis, as well as from backstage and outside the theatre. In the final sequence, for example, several shots of the performance are intercut with those of the audience, creating a contrast between the often vivid colours of the actors’ costumes and the more ‘natural’ reverse shots of the audience. 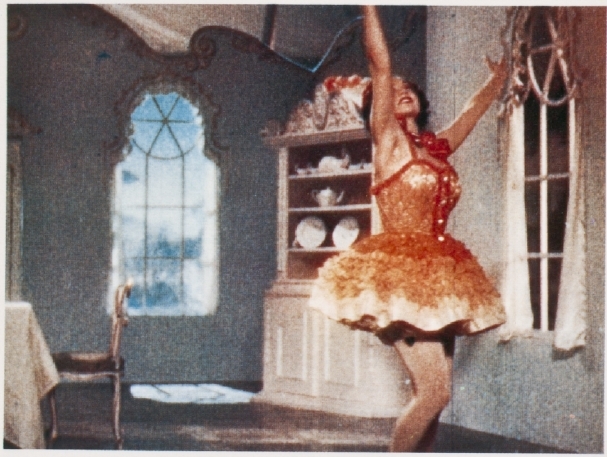 The cinema audience is thus encouraged to compare the two styles of colour – the theatrical, spectacular mode for the performance with one costume a deep red/orange and another with a green and red diamond pattern – and the more generally subdued colours for the shots of the audience. This contrasting display is rather like a combination of applied and photographic colour since the prologue features a shot in shades of red to depict a sunset (as with tinting), and the later shots of the audience from the viewpoint of the troupe appear as a photographic process.